On my desk this week are a few projects that I have been working on for Christmas. On the left is a Merry Christmas banner that I bought which was a cheap banner from Asda and decided to add some snowflakes and green stickles glitter to, to add more dimension. It is going to go under my mantel. Also there are some wooden hearts that I am going to paint red but not entirely sure what I am going to do with them yet. 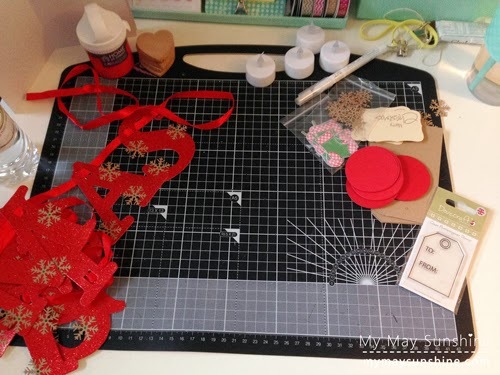 On the right are some pieces I have die cut to make some gift tags. I have used a couple of Clearly Besotted stamps to make the tags. I like to cut out all the pieces first and then put them all together. Lastly are some battery operated lights to put in some Christmas jars and decorations and for another project that I will be doing soon and will hopefully will show on the blog. So I have a few things to keep me busy today. Hope you have a lovely day and enjoy looking at the other desks. Linking up to Julia @ Stamping Ground. woyww 227 – what’s on my desk.